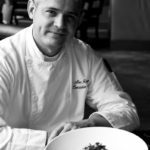 The executive chef at Arlington’s Harry’s Tap Room spends most of his time at the Clarendon location, and there’s a second location in Pentagon City Mall. Reyes, like most chefs, is an artist, and this is where the creativity comes in. 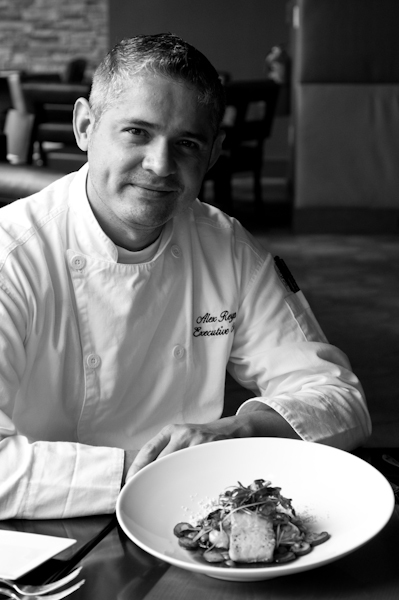 When Chef Alex gets a lamb loin, for example, he sees endless uses for each product. But in that same piece of lamb, I would see a challenge. “You have your strengths, I have my strengths,” he said, smiling. Feeling a bit better about my occasional “recipe burnout” in my home kitchen, Chef Alex continued,” We’re not all magicians in the kitchen. Go to the library, get inspired.” He suggests finding a base, something to work from, such as one ingredient or go to restaurants to get ideas. Especially when you’re beginning to get adventurous in the kitchen, keep it simple. “Don’t play with the food too much,” he warned. But when it comes down to it, Reyes is constantly playing with his food. Hesitating to use the phrase “molecular gastronomy,” Reyes noted that he uses techniques to create “contemporary cuisine.” Take his Chocolate Torte with Vanilla Ice Cream. 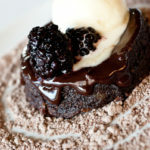 He adds blackberries marinated in Grand Marnier with a chocolate “powder” sauce. That’s right: chocolate powder sauce. Using a secret process, Chef Alex magically turns melted chocolate into a delectable powder. The torte itself is flourless, made with almond powder. As we chatted in Harry’s main-floor bar one afternoon, I was surprised – more like shocked – when he told me that though he was selected for an internship at El Bulli, quite possibly the best restaurant on earth, he passed on the opportunity and chose not to leave the woman who became his wife. 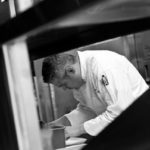 Some of us might scoff at this choice – I’m still kind of incredulous, to be honest – but perhaps Chef Alex is wiser than us all. The couple has been married for three years and recently welcomed their first child into the family. Use Spanish paprika to add smoky and sweet flavors. The anise flavor in fennel is a great compliment to seafood. Julienned fennel is great with orange slices in a salad; the sweetness of the orange balances the anise flavor. Fennel seed is Reyes’ secret ingredient for a perfectly balanced bison burger. The trick to cooking the perfect sea scallop is to slice it in half and pan sear to perfection. While a thick scallop looks nice, the middle of the shellfish isn’t likely to cook properly. Play with texture when cooking, not just flavor. Perfection pays off. My husband – Every Food Fits’ official food taster – and I went to Harry’s for brunch this past Sunday, a day when Reyes was out of town. The excellent quality of my French toast and hubby’s eggs Benedict proved that he runs a tight ship, and one that sails smoothly even when he’s out of the kitchen. Ay caramba. Now that is how French toast is meant to taste. Perhaps I should say “oy caramba,” since the main ingredient is challah, which is soaked overnight in a crème Anglaise. The time might fly in the kitchen, but this fall, Harry’s Tap Room is all about slow cooking. The new menu will likely debut mid-October and include more “farm direct” produce, meat and dairy products, according to Oren Molovinsky, managing partner for the restaurant. Molovinsky also helped build Farm to Table D.C., an organization that connects restaurateurs directly to farmers to establish wholesale relationships beneficial for all parties, also creating a win for the consumer. “This supports farmers and allows them to stay on the farms,” Molovinsky said. He argued that farmers markets have their place, but they’re a huge draw on the farmer’s time/energy/money, which could be better spent building relationships with chefs who would purchase mass quantities of product. This tactic means that Harry’s will get cuts of beef and other meat that you’re not likely to find in other restaurants. “That’s the difference between us and them,” Molovinsky noted, comparing Harry’s to the competition. The menu will include local produce, too. “Everything is about the root vegetables in winter,” Reyes noted. Watch for turnips, parsnips and a root vegetable ratatouille. 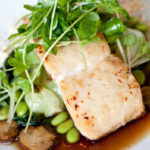 One of the most popular dishes, pictured here in the post, is the Halibut Miso. It’s served with baby bok choy, braised mushrooms, edamame, daikon sprouts and sprinkled with his special red curry oil powder. And be sure to try the fresh-baked biscuits and bread, served with Trickling Springs Creamery butter and strawberry preserves made in-house with apple pectin. Oftentimes, Molovinsky said, diners request to take some home in a jar. He’s this close to bottling it for sale, I can just tell. So next time you’re in the restaurant, request a jar of the preserves. It never hurts to ask. DISCLOSURE: Harry’s Tap Room treated us to brunch on Sunday. Our delightful and knowledgeable server ignored our protestations and demands for the check. But in no way did the meal sway the opinions expressed herein. Great interview! I love the food at Harry’s, and they’ve been a big supporter of us at DC Central Kitchen! Thanks for another GREAT piece! I treasure the opportunity to get to know a restaurant, no less one I haunt from time to time, in a way that I cannot just sitting at the tables.